The word "skyscraper" originally was a nautical term referring to a small triangular sail set above the skysail on a sailing ship. The term was first applied to buildings in the late 19th century as a result of public amazement at the tall buildings being built in Chicago and New York City. The first skyscraper was for many years thought to be the Home Insurance Building built in Chicago, Illinois in 1885. More recent evidence points to New York's Equitable Life Assurance Building built in 1870 preceding the Chicago building by 15 years and was the first office building built using a skeletal frame. The structural definition of the word skyscraper was refined later by architectural historians, based on engineering developments of the 1880s that had enabled construction of tall multi-storey buildings. This definition was based on the steel skeleton—-as opposed to constructions of load-bearing masonry, which passed their practical limit in 1891 with Chicago's Monadnock Building. Philadelphia's City Hall, completed in 1901, still holds claim as the world's tallest load-bearing masonry structure at 167 m (548 ft). The steel frame developed in stages of increasing self-sufficiency, with several buildings in Chicago and New York advancing the technology that allowed the steel frame to carry a building on its own. Today, however, many of the tallest skyscrapers are built almost entirely with reinforced concrete. Pumps and storage tanks maintain water pressure at the top of skyscrapers. A loose convention in the United States and Europe now draws the lower limit of a skyscraper at 150 meters (~500 ft). A skyscraper taller than 300 meters (~1000 ft) may be referred to as supertall. Shorter buildings are still sometimes referred to as skyscrapers if they appear to dominate their surroundings. The somewhat arbitrary term skyscraper should not be confused with the also ill-defined term high-rise. The Emporis Standards Committee defines a high-rise building as "a multi-story structure between 35-100 meters tall, or a building of unknown height from 12-39 floors" and a skyscraper as "a multi-story building whose architectural height is at least 100 meters." Some structural engineers define a highrise as any vertical construction for which wind is a more significant load factor than earthquake or weight. Note that this criterion fits not only high rises but some other tall structures, such as towers. The Great Pyramid of Giza, circa 2560 BC, was 146 m tall and its height was unsurpassed until at least the 14th century AD. High-rise apartment buildings already flourished in classical antiquity: ancient Roman insulae in Rome and other imperial cities reached up to 10 and more stories, some with more than 200 stairs. Several emperors, beginning with Augustus (r. 30 BC-14 AD), attempted to establish limits of 20–25 m for multi-storey buildings, but met with only limited success. The lower floors were typically occupied by either shops or wealthy families, while the upper stories were rented out to the lower classes. Surviving Oxyrhynchus Papyri indicate that seven-storey buildings even existed in provincial towns, such as in 3rd century AD Hermopolis in Roman Egypt. The medieval Egyptian city of Fustat housed many high-rise residential buildings, which Al-Muqaddasi in the 10th century described as resembling minarets. Nasir Khusraw in the early 11th century described some of them rising up to 14 stories, with roof gardens on the top floor complete with ox-drawn water wheels for irrigating them. Cairo in the 16th century had high-rise apartment buildings where the two lower floors were for commercial and storage purposes and the multiple stories above them were rented out to tenants. An early example of a city consisting entirely of high-rise housing is the 16th-century city of Shibam in Yemen. Shibam was made up of over 500 tower houses, each one rising 5 to 11 storeys high, with each floor being an apartment occupied by a single family. The city was built in this way in order to protect it from Bedouin attacks. Shibam still has the tallest mudbrick buildings in the world, with many of them over 100 feet (30 m) high. An early development was Oriel Chambers in Liverpool. Designed by local architect Peter Ellis in 1864, the building was the world's first iron-framed, glass curtain-walled office building. It was only 5 floors high as the elevator had not been invented. Further developments led to the world's first skyscraper, the ten-storey Home Insurance Building in Chicago, built in 1884–1885. While its height is not considered very impressive today, it was at that time. The architect, Major William Le Baron Jenney, created a load-bearing structural frame. In this building, a steel frame supported the entire weight of the walls, instead of load-bearing walls carrying the weight of the building. This development led to the "Chicago skeleton" form of construction. Sullivan's Wainwright Building in St. Louis, 1891, was the first steel-framed building with soaring vertical bands to emphasize the height of the building, and is, therefore, considered by some to be the first true skyscraper. Most early skyscrapers emerged in the land-strapped areas of Chicago, London, and New York toward the end of the 19th century. A land boom in Melbourne, Australia between 1888-1891 spurred the creation of a significant number of early skyscrapers, though none of these were steel reinforced and few remain today. Height limits and fire restrictions were later introduced. London builders soon found building heights limited due to a complaint from Queen Victoria, rules that continued to exist with few exceptions until the 1950s. Concerns about aesthetics and fire safety had likewise hampered the development of skyscrapers across continental Europe for the first half of the twentieth century (with the notable exceptions of the 26-storey Boerentoren in Antwerp, Belgium, built in 1932, and the 31-storey Torre Piacentini in Genoa, Italy, built in 1940). After an early competition between New York City and Chicago for the world's tallest building, New York took the lead by 1895 with the completion of the American Surety Building, leaving New York with the title of tallest building for many years. New York City developers competed among themselves, with successively taller buildings claiming the title of "world's tallest" in the 1920s and early 1930s, culminating with the completion of the Chrysler Building in 1930 and the Empire State Building in 1931, the world's tallest building for forty years. The first completed World Trade Center tower became the world's tallest building in 1972 for two years. That changed with the completion of the Sears Tower (later renamed the Willis Tower) in Chicago in 1974, which became the world's tallest building until 1998. The Willis Tower in Chicago was the world's tallest building from 1974 to 1998, and remains the tallest in the United States. The Petronas Twin Towers, the world's tallest twin buildings. The Commerzbank Tower in Frankfurt/Germany is the tallest completed skyscraper in the European Union. 30 St Mary Axe in London, United Kingdom is an example of a modern environmentally friendly skyscraper. From the 1930s onwards, skyscrapers also began to appear in Latin America (São Paulo, Santiago Caracas, Bogotá, Mexico City) and in Asia (Tokyo, Shanghai, Hong Kong, Manila, Singapore, Mumbai, Jakarta, Kuala Lumpur, Taipei, Bangkok). Immediately after World War II, the Soviet Union planned eight massive skyscrapers dubbed "Stalin Towers" for Moscow; seven of these were eventually built. The rest of Europe also slowly began to permit skyscrapers, starting with Madrid, in Spain, during the 1950s. Finally, skyscrapers also began to be constructed in cities of Africa, the Middle East and Oceania (mainly Australia) from the late 1950s. In the early 1960s structural engineer Fazlur Khan realized that the rigid steel frame structure that had "dominated tall building design and construction so long was not the only system fitting for tall buildings", marking "the beginning of a new era of skyscraper revolution in terms of multiple structural systems." His central innovation in skyscraper design and construction was the idea of the "tube" structural system, including the "framed tube", "trussed tube", and "bundled tube". These systems allowed far greater economic efficiency, and also allowed efficient skyscrapers to take on various shapes, no longer needing to be box-shaped. Over the next fifteen years, many towers were built by Khan and the "Second Chicago School", including the massive 442-meter (1,451-foot) Willis Tower. Chicago is currently undergoing an epic construction boom that will greatly add to the city's skyline. Since 2000, at least 40 buildings at a minimum of 50 stories high have been built or planned. The Chicago Spire, Trump International Hotel and Tower, Waterview Tower, Mandarin Oriental Tower, 29-39 South LaSalle, Park Michigan, and Aqua are some of the more notable projects currently underway in the city that invented the skyscraper. Chicago, Hong Kong, and New York City, otherwise known as the "the big three," are recognized in architectural circles as having especially compelling skylines. A landmark skyscraper can inspire a boom of new high-rise projects in its city, as Taipei 101 has done in Taipei since its opening in 2004. Large cities currently experiencing skyscraper building booms include London in the United Kingdom, Shanghai in China, Dubai in the United Arab Emirates, and Miami, which now is third in the United States. The Flatiron Building, standing 285 ft (87 m) high, was one of the tallest buildings in the city upon its completion in 1902, made possible by its steel skeleton. It was one of the first buildings designed with a steel framework, and to achieve this height with other construction methods of that time would have been very difficult. Subsequent buildings such as the Singer Building, the Metropolitan Life Tower were higher still. That same year, the Chrysler Building took the lead as the tallest building in the world, scraping the sky at 1,046 feet (319 m). Designed by William Van Alen, an art deco masterpiece with an exterior crafted of brick, the Chrysler Building continues to be a favorite of New Yorkers to this day. The World Trade Center officially reached full height in 1972, was completed in 1973, and consisted of two tall towers and several smaller buildings. For a short time, the first of the two towers was the world's tallest building. Upon completion, the towers stood for 28 years, until the September 11, 2001 attacks destroyed the structures. Various governmental entities, financial firms, and law firms called the towers home. The Willis Tower (formerly Sears Tower) was completed in 1974, one year after the World Trade Center, and surpassed it as the world's tallest building. It was the first building to employ the "bundled tube" structural system, designed by Fazlur Khan. The building was not surpassed in height until the Petronas Towers were constructed in 1998, but remained the tallest in some categories until Burj Khalifa surpassed it in all categories. It is currently the tallest building in the United States. Momentum in setting records passed from the United States to other nations with the opening of the Petronas Twin Towers in Kuala Lumpur, Malaysia, in 1998. The record for world's tallest building remained in Asia with the opening of Taipei 101 in Taipei, Taiwan, in 2004. A number of architectural records, including those of the world's tallest building and tallest free-standing structure, moved to the Middle East with the opening of the Burj Khalifa in Dubai, UAE. This geographical transition is accompanied by a change in approach to skyscraper design. 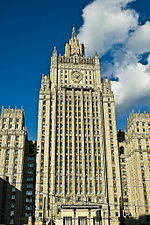 For much of the twentieth century large buildings took the form of simple geometrical shapes. This reflected the "international style" or modernist philosophy shaped by Bauhaus architects early in the century. The last of these, the Willis Tower and World Trade Center towers in New York, erected in the 1970s, reflect the philosophy. Tastes shifted in the decade which followed, and new skyscrapers began to exhibit postmodernist influences. This approach to design avails itself of historical elements, often adapted and re-interpreted, in creating technologically modern structures. The Petronas Twin Towers recall Asian pagoda architecture and Islamic geometric principles. Taipei 101 likewise reflects the pagoda tradition as it incorporates ancient motifs such as the ruyi symbol. The Burj Khalifa draws inspiration from traditional Arabic art. Architects in recent years have sought to create structures that would not appear equally at home if set in any part of the world, but that reflect the culture thriving in the spot where they stand. Today, skyscrapers are an increasingly common sight where land is expensive, as in the centres of big cities, because they provide such a high ratio of rentable floor space per unit area of land. But they are built not just for economy of space. Like temples and palaces of the past, skyscrapers are considered symbols of a city's economic power. Not only do they define the skyline, they help to define the city's identity. Construction of the Pagcor Tower started in 2009, will be the second-tallest free-standing structure in the world when it is completed. Standing at a height of 665 meters, the tower will be located in Manila Bay near the Mall of Asia. The Lotte Super Tower 123, a mixed-use skyscraper in Seoul, South Korea, will stand 555 meters (1,821 feet) in height upon its scheduled completion in 2014. The tower will house retail space, residences, and a luxury hotel. Construction of the 133-floor, 640m supertall Digital Media City Landmark Building in Digital Media City, Seoul, South Korea, started in 2009, which will be the second-tallest building in the world when it is completed in 2015, housing the world's tallest observatory and hotels. Being constructed at the fastest speed among major skyscraper projects by South Korea's Samsung C&T (who also built Burj Khalifa), the supertall is the first skyscraper to contain an entire city inside a building, including the world's largest aquarium, a luxury department store, shopping malls, clinic center, high-tech offices, first-class apartments, six to eight-star hotels, a concert restaurant, a broadcasting studio and an art center. Construction of the 151-floor, 610m supertall 151 Incheon Tower in Songdo International City, Incheon, South Korea, started in 2008, which will be the tallest twin towers in the world when it is completed in 2014. The Abraj Al-Bait Towers also known as the "Mecca Royal Clock Hotel Tower" is a complex under construction in Mecca, Saudi Arabia by the Saudi Binladin Group,the complex consists of seven towers the tallest tower (Hotel Tower) stand on a hight of 595 m (1,952 ft). Upon completion in 2011, the structure would have the largest floor area of any structure in the world with 1,500,000 square metres (16,137,600 sq ft) of floorspace. Construction of the 123-floor, 555m supertall in Lotte World 2, Seoul, South Korea, started in 2005,however it is currently on-hold,it was expected to be completed in 2014. Construction of the 110-floor, 510m supertall in Busan Lotte World, Busan, South Korea, started in 2009, which will be the third tallest building world when it is completed in 2013. Construction did start for a 610 m (2,001 ft) skyscraper in Chicago, however the estimated completion date is unknown, as the project is on hold. The Chicago Spire, with 150 floors, would be the second tallest residential building in the world if completed. Designed by Santiago Calatrava, it would also hold the title of North America's tallest free-standing structure. 1 World Trade Center is now under construction and is the tallest tower comprising the redevelopment of the site of the former World Trade Center following the attacks of September 11, 2001. Its antenna will reach a height of 541.4 m (1,776 ft), a height representing the year of the United States Declaration of Independence. The Port Tower is a building planned for Karachi, the financial capital of Pakistan, with the collaboration of local and foreign investors, in association with the Karachi Port Trust. When completed, the new structure will be 1,947 ft (593 m) high. The height of the tower has a special significance, representing the year Pakistan gained independence. The 308 m (1,010 ft) Tour Generali in Paris La Défense, scheduled to be completed in 2013, is an entirely green building office skyscraper that is set to be the tallest building in Paris and the second tallest in the European Union after the Shard of Glass in London. Construction of London's Shard of Glass started in March 2009, and is scheduled to be completed in May 2012, in time for the London Olympics. At 310 m (1,017 ft), it is set to be the tallest building in the European Union. Despite these costs, the size of skyscrapers allows for high-density work and living spaces, reducing the amount of land given over to human development. Mass transit and commercial transport are economically and environmentally more efficient when serving high-density development than suburban or rural development. Also, the total energy expended towards waste disposal and climate control is relatively lower for a given number of people occupying a skyscraper than that same number of people occupying modern housing. Indeed, though the city of Paris, for example, has almost the population density of Manhattan, Paris' stringent building codes and unchanging borders have made it difficult to create the larger buildings and utilities needed for a growing population within the actual city limits. This inflexibility has led many important institutions and departments to locate outside of city limits (such as the La Défense business district and the Department of Transportation). ^ Ivars Peterson (April 5, 1986). "The first skyscraper - new theory that Home Insurance Building was not the first". CBS Interactive. http://findarticles.com/p/articles/mi_m1200/is_v129/ai_4501450/. Retrieved January 6, 2010. ""In my view, we can no longer argue that the Home Insurance Building was the first skyscraper," says Carl W. Condit, now retired from Northwestern University in Evanston, Ill., and author of several books on Chicago architecture. "The claim rests on an unacceptably narrow idea of what constitutes a high-rise commercial building," he says. "If there is a building in which all these technical factors--structural system, elevator, utilities--converge at the requisite level of maturity," argues Condit, "it's the Equitable Life Assurance Building in New York." Completed in 1870, the building rose 7-1/2 stories, twice the height of its neighbors. To lighten the building and keep costs down, engineer George B. Post used a primitive type of skeletal frame in its construction. A great fire destroyed the building in 1912"
^ Data Standards: high-rise building (ESN 18727), Emporis Standards, accessed on line October 16, 2009. ^ Data Standards: skyscraper (ESN 24419), Emporis Standards, accessed on line October 16, 2009. ^ a b Gregory S. Aldrete: "Daily Life in the Roman City: Rome, Pompeii and Ostia", 2004, ISBN 9780313331749, p.79f. ^ Alfred Swenson & Pao-Chi Chang (2008). "Building construction: High-rise construction since 1945". Encyclopædia Britannica. http://www.britannica.com/EBchecked/topic/83859/building-construction/60143/High-rise-construction-since-1945#toc60143. Retrieved 2008-12-09. ^ a b "Khan, Fazlur Rahman". Banglapedia. http://banglapedia.search.com.bd/HT/K_0187.htm. Retrieved 2008-12-09. ^ Gramsbergen, Egbert and Paul Kazmierczak. "The World's Best Skylines". http://homepages.ipact.nl/%7Eegram/skylines.html. Retrieved 2008-05-04. ^ Pollak, Michael (April 23, 2006). "75 YEARS: F. Y. I.". The New York Times. http://query.nytimes.com/gst/fullpage.html?res=9D03EEDD153FF930A15757C0A9609C8B63&scp=4&sq=%22empire%20state%20building%22%20height%201,454&st=cse. Retrieved 2009-10-31. ^ Owainati, Sadek (2008-11-03). "Reaching for the stars". ArabianBusiness.com. http://www.arabianbusiness.com/537095-reaching-for-the-stars. Retrieved 2008-11-15. ^ "Shanghai Center main building will reach 632 meters". People's Daily Online. 2008-08-18. http://english.people.com.cn/90001/90776/6479288.html. Retrieved 2008-08-19. ^ "上海中心大厦项目环境影响报告书简本公示" (in Chinese) (pdf). Envir.gov.cn. 2008-08-13. http://www.envir.gov.cn/info/2008/200808131.pdf. Retrieved 2008-08-14. ^ "Shanghai Center". Emporis. http://www.emporis.com/en/wm/bu/?id=323473. Retrieved 2008-05-17. ^ "Tallest Chinese building features indoor gardens". Shanghai Daily. 2008-07-24. http://www.shanghaidaily.com/sp/article/2008/200807/20080724/article_367915.htm. Retrieved 2008-08-09. SkyScrapers.org High Resolution skyscraper illustrations. A skyscraper is a very tall, continuously habitable building. A skyscraper is a boast in glass and steel. Manhattan has no choice but the skyward extrusion of the Grid itself; only the Skyscraper offers business the wide-open spaces of a man-made Wild West, a frontier in the sky. As the twentieth century fades, North America is ceding skyscraper supremacy to Asia. The tall building ought to participate in the city as both a facade, connecting the walls of the street, and as an object against the sky." Architecture is the alphabet of giants; it is the largest set of symbols ever made to meet the eyes of men. A tower stands up like a sort of simplified statue, of much more than heroic size. A skyscraper is a very tall building, usually more than 152 metres (500 feet) in height. A highrise is another name that people call skyscrapers. Skyscrapers are almost always found in cities. Many large cities have many skyscrapers. 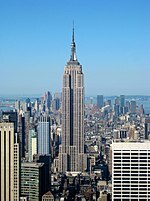 For example, New York, a large city in the USA, has a famous skyscraper called the Empire State Building. In the last 20 years, people have been building skyscrapers in cities like London, England that did not have many tall buildings in the past. At the start, the word skyscraper meant a tall sail on a sailing ship. The word's meaning has changed, and today it means a tall building. Until the nineteenth century, buildings taller than six stories tall were not common. Tall buildings made out of weak metals would fall down. People also did not like walking up many stairs. Also, running water could only be brought up to fifty feet high. Better technology helped make skyscrapers more common. Stronger building materials such as steel and reinforced concrete were developed, so stronger skyscrapers could be built. Water pumps brought water up to heights above fifty feet.